A VC's recent suggestion that women in tech use an initial instead of a first name to escape bias grated on many readers. Venture capitalist John Greathouse doesn't believe women who want to work in the tech industry should use their full names online. Just use a first initial, he suggested in a now widely criticized blog post in the Wall Street Journal in late September -- one he eventually apologized for. By using an initial, Greathouse argued, hiring managers won't know you're female and will treat you the same as any other applicant, without any sort of unconscious bias trickling in. I disagree -- because I see women in tech from a different lens. In fact, it's more than that: My view is the polar opposite of what Greathouse is saying. Not only do I want to see women's full names when they apply to work in tech, but I am actively seeking them out for investment and recruiting them to work with my early stage venture capital firm, White Star Capital, every day. Why? Because the women who are working in technology today know how to triumph over adversity. This is a group that has suffered significant bias in our society -- studying computer science or engineering in college, going out into the male-dominated environment of the modern tech world and succeeding despite those biases. And then, many have gone on to start companies in the tech industry despite the well-known challenges there. That is a fact to be celebrated, and sought out by investors looking for high-performance collaborators, not hidden behind initials. These are women that I want to talk to. These are the proven entrepreneurs that I want to invest in. I admittedly am biased because of my academic background in computer science at the University of Waterloo and my prior experience at Microsoft and aQuantive. 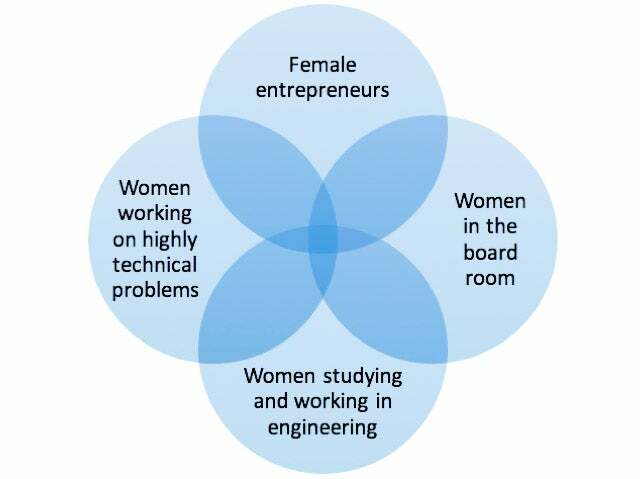 Many of the women that I studied with were brilliant, and in my past life as an engineering and product lead, many of the female engineers that I worked with were among my teams' superstars. This collection of former colleagues includes the team that launched the first version of Microsoft.NET -- you can imagine how strong all of those team members were -- and the founding team at aQuantive, which was eventually acquired for $6.3 billion. In short, I know that women can be game-changers in tech, and I've seen it firsthand. Still, there is another force at play here, and it is one that I believe is holding back not only the startup community's female founders but the entire tech industry as a whole. While I see impressive growth in female entrepreneurship -- and I love being part of the New York City ecosystem, which is "Officially the Best City in the World for Women Entrepreneurs" -- there is a form of female entrepreneurship that I eagerly want to see more of: that's growth in the number of female technical founders of highly technical companies. I define these as companies doing work in areas like database development, artificial intelligence, machine learning, the internet of things, M2M, etc. Given my background, I am naturally drawn to highly technical companies where technology is one of the company's key strengths and key barriers to entry. This perception is pervasive across the industry. I was at a conference recently where a highly regarded female VC (who will remain nameless) said on stage something along the lines of its being obvious that female entrepreneurs are most likely to create startups focused on ecommerce, fashion, media, social, etc. She may have been commenting on the apparent numbers in our imperfect world. But I still respectfully disagree with the statement. If we removed the bias and barriers girls and women face across society, female entrepreneurs would be as inclined as men to launch any kind of startup. I am undeniably happy every time I read a new list of impressive tech companies that have women founders. These are fantastic companies led by impressive entrepreneurs. But most of the companies on these lists do not have technology as one of their leading differentiators. They are too often, as predicted by the VC mentioned above, doing work on what I view as the fringes of tech -- social media, advertising, retail and so on. Regardless of why this bifurcation exists, it is a loss for our industry. I adamantly believe that women can and should be the founders of successful startups that will follow in the footsteps of deep tech companies like MongoDB and Domo, both of which I consider highly technical companies. In fact, there are already a number of impressive examples of successful female founders of similar companies, including but not limited to: VMware's Diane Greene, semiconductor company Marvell's Weili Dai, Sunrun's Lynn Jurich, Pixel Qi's Mary Lou Jepsen, Clara Labs' Maran Nelson and PlanGrid's Tracy Young. These are successful, tech-focused women who hopefully never needed to hide behind their initials online in order to get ahead in Silicon Valley. I am convinced that the number of technical women who will follow in their footsteps will grow exponentially over the next several years, helped by organizations such as Women Who Code, TechGirlz.org, MentHER, Empress Capital. A powerful new ally for women in tech will be an as-yet unnamed new initiative from Melinda Gates. There are also gender-neutral apps, like Hopscotch, which teach children to code, the STEMinists at Skillcrush and accelerators such as Grand Central Tech. The overall lack of female entrepreneurship in high-tech fields is an absolutely critical issue that we collectively must work on fixing. I am not alone in this opinion, but it's important to remember that there are several levels to this problem. It isn't enough to simply hire more women for tech roles. We need to create an environment where women feel empowered to work in even in the most tech-focused parts of the tech industry, starting companies and driving growth. Women need the same sponsorship and mentorship available to men. Only then will we be able to take steps toward true equality of opportunity and success in technology -- with full names attached.